How Much Profit does your Handmade Business REALLY Make? 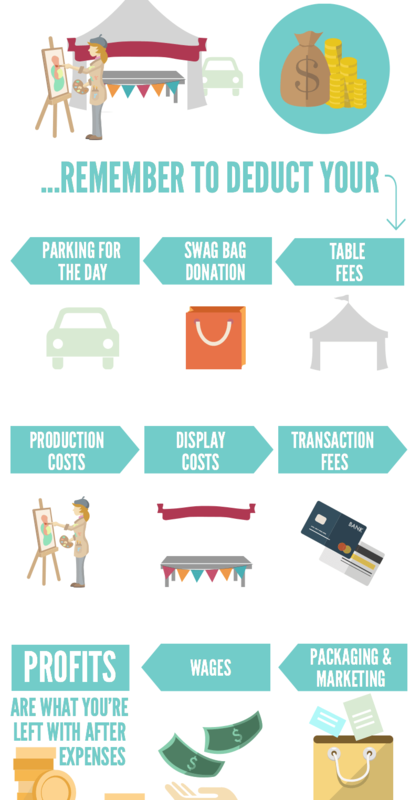 I know you love what you do…..and you can’t put a price on happiness…..but when you walk away from a craft fair with $1500, have you considered that $500 was spent on your booth fee, parking for the day and swag bag donations? What about when you look at what you made this month? Are you deducting the expense of needing your sewing machine repaired, transaction fees or the cost of hosting for your website? This is an area many handmade business owners ignore completely or do rough estimates without getting into all the details. Trust me, I get it. My eyes instantly glaze over when I see a spreadsheet full of numbers. But if you want to run a business that makes enough money to run again next month, you need to get real with your numbers. WHY DO I NEED TO CALCULATE PROFITS? Where your money is being spent? If you’re paying yourself the hourly wage you want? If you’re making enough money to go bigger and better next month? Even if this is more of a hobby for you, you should know that you’re making enough money to buy more supplies and not out of your own pocket. If one area of your business is eating up a ton of money, you want to refocus and try a different angle. Calculating your profits allows you to see where there’s unbalance. You get a very clear picture of where your money is going and how big of a gap there is between your revenue and profit. Without that process, you could go years thinking you’re running a profitable business when really you’re paying for many expenses out of your own pocket and neglecting to pay yourself a wage. You’d essentially be going in circles instead of climbing up. Running a handmade business isn’t ALL about profits (it’s also fun, allows you to be creative and meet some amazing people) but profits should be a focus. What’s going to be most profitable should play a role in which products you make, the supplies you buy, craft fairs you participate in and any other aspect you spend your money on. WHAT’S THE DIFFERENCE BETWEEN REVENUE & PROFITS? Revenue is considered all the money that comes in from your business. 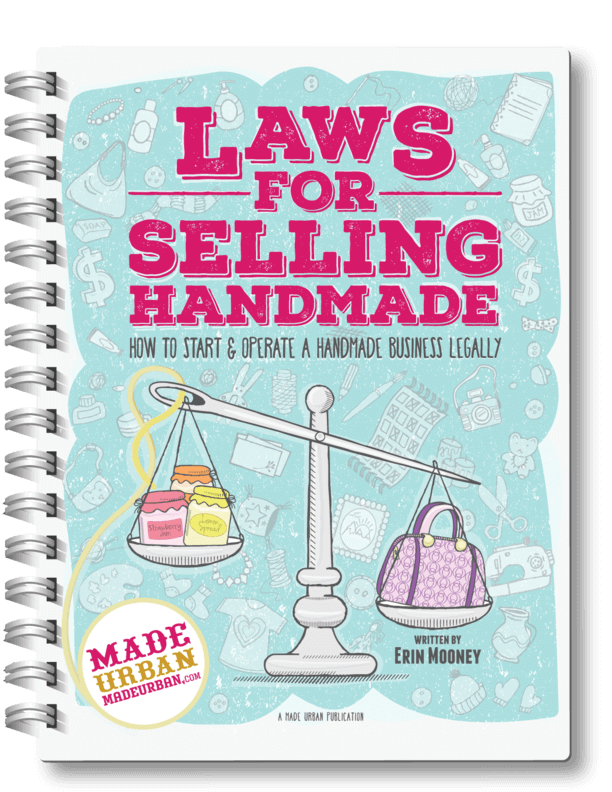 If you sell handmade goods and also offer workshops to teach your craft, you would add up all the money that came in from selling your products and services and call that your revenue or sales. Profit is considered the money that’s left after a business subtracts all of their expenses from their revenue. If you sold $100 worth of product and your expenses to make and sell that product were $25, your profit would be $75. your accountant along with the printed receipts. WHAT TYPE OF EXPENSES DOES A HANDMADE BUSINESS HAVE? Let’s use a couple examples to start shall we? You’ve just gotten home from selling at a craft fair all weekend. You have $1500 from the sales of your product. $1500 in one weekend?! That’s pretty sweet. But before you quit your day job and wave goodbye with one finger, let’s take a closer look at how much you actually profited. Below is an example of the expenses you might incur. Let’s focus on the expenses that might come from just one of those platforms. In this example we’ll say that you have $300 in your PayPal account from sales that came from an online market that charges fees for listing and selling through it. I know you may be looking at the wage section and thinking; “wait a minute, my wage goes into my pocket so that should be part of my profits”. Remember profit is what’s left over once you cover all costs of doing business. If you didn’t show up at that craft fair, you either a) Wouldn’t sell anything or b) Would be paying someone else to sell for you. If your business’ profits are based on you not taking a wage, you’re not accurately measuring your success. If you can’t pay yourself a proper wage after covering all your costs, how will you pay an employee when you grow to that point? You have to factor in your wages when you’re determining your profits to not only put a value on your time but also to see how much money is left over to put back into your business and how much you’re growing. Let’s say you worked the same craft fair mentioned above, spending 22 hours promoting, preparing, setting up and selling for it. You still want to pay yourself $25/hour. If you made $900 at that craft fair and deduct all your expenses outside of your wage (table fees, swag bag, parking, etc at $823) you would be left with $77. At $25/hour, you’d only be able to pay yourself for 3 of those 22 hours of work. Or looking at it another way: you’re paying yourself $3.50/hour for the work you put in. Would you accept either of those from an employer? I would hope not! If you put 22 hours in and they said they can only pay you for 3 of them you would never work for them again. Or if they said they have 22 hours of work for you but they’re only going to pay you $3.50/hour, you’d likely turn down the job. When you get a paycheck from an employer for the hours you worked, that money is transferred out of the business’ bank account and into yours. The money the employer is left with after paying all their bills and employees is their profit. They use that profit to buy more product to sell next month. When you pay yourself a wage, that’s the money you use to buy new clothes, purchase groceries or pay your mortgage. You can’t pay for those things without taking the money out of your business account and putting it into your personal account. What you’re left with in yourbusiness account is your profit. That’s the money you use to purchase more supplies to keep your business going. If you constantly have to dig into your personal account to fund your business, it’s not profitable or sustainable. You want to see that your profits are large enough to buy more supplies each month, sign up for bigger craft fairs and build more elaborate displays. If you’re only bringing in enough profit to make the same amount of stock, sell at the same sized craft fair and use the same display, you’re not growing. Without growth, we get bored. You also want to be creating a nest egg with your profits. If you have a slow month or craft fair, you can dip into those profits to pay yourself a wage so you can still pay your mortgage. I can’t stress enough the importance of proper pricing. Without it your business won’t last. Account for all your expenses and put a value on your time! Not paying yourself an hourly wage may be okay in the beginning when you’re a start up but aim to deduct that amount each month if you want to run a sustainable business. WHAT OTHER EXPENSES MIGHT THERE BE? In the above examples, we’ve only looked at expenses directly related to the selling platform (craft fairs or an online market). When calculating profits for the month, you would still need to account for day-to-day expenses. This is not an exhaustive list of the expenses a small handmade business incurs. Nor is it a list of tax-deductible expenses. It’s an example of the areas a small business owner requires to run their business and the costs and time associated with each area. Tape, paper clips, stapler, etc. Shrinkage – any inventory lost due to being damaged, stolen, lost in transit, mistakes, flaws, etc. Anything you do to run your business. Consider this: if you wouldn’t do it for free for an employer, don’t do it for free for yourself. If you have to pay taxes, you’ll pay them on your taxable income (profit). The more you document as an expense, the less your taxable income is, which means more money left in your pockets. But wait! The list above is not a list of tax-deductible expenses. What’s tax deductible varies by country and system so…..
Talk to an accountant before you start adding up your expenses for tax submission. This article should not be taken as professional advice. Speak to your accountant for the most accurate and up to date information for your profession and jurisdiction. Get a separate checking account / credit card – using one account to put revenue in and take expenses out of makes it really easy for tracking and allows you to keep a closer eye on whether you’re getting ahead or going under. Add up your expenses regularly – set a day each week or each month to enter all your expenses and revenue and file your receipts. Leaving it too long is going to make it feel like a daunting task and you’ll likely procrastinate on it. You should be checking in each month to see how your business is profiting. Create a receipt filing system that works for you – it’s important that you keep all your receipts if you’re filing expenses. If you’re writing off portions of your home, your car, etc. and the government comes knocking, looking for proof of these expenses, you better have that proof in the form of receipts. Make it fun – I’m a sucker for pretty stationery so I used tracking expenses as an excuse to go out and find a cute notebook and accordion file to keep track of my expenses and receipts. This article is for information purposes only and is not necessarily kept up to date. Speak to an insurance professional for the most up to date information for your profession and jurisdiction. Thanks so much for reading Lori! Glad you found it helpful. This is such an amazing resource! It’s all the great tips articles rolled into one. Thank you!